… gathered for the feast. 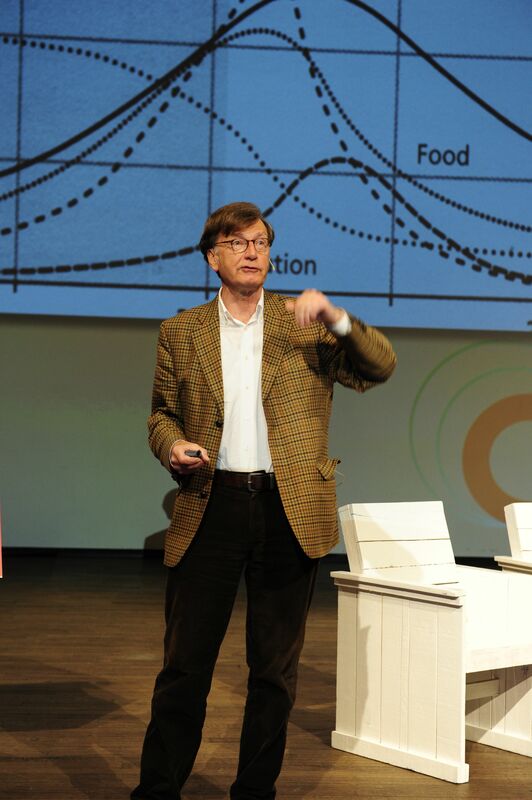 Klaas van Egmond argues that we must re-think and reflect upon human dignity and sustainability in order to re-­invent society. 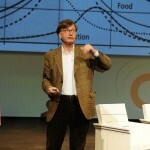 He has learned that the solution for the sustainability problem has to be found in social and cultural dynamics, rather than in technological development only. We must study our values first, as these determine the economic, financial and societal systems. Van Egmond sketched a brief history of the Western Civilization. We have failed to stay between the lines. Our lack of consensus in the understanding of human nature has allowed society to degenerate into its own caricature and associated catastrophe. Instead of a focus on balance, reconciling the controversies, we generated a one-sided version of specific human values. But there is always hope. Only last night, the Dutch parliament succeeded to draft a new approach including all political parties! For once, the adversaries chose to collaborate in designing a common future. Working with partners from opposite ends automatically results in a virtuous centre…. Klaas van Egmond sees an important role for appreciative inquiry. The ultimate truth is knowing by compassion. This implies that people must engage in connection, emphatically inquiring for the matters that worry, the dreams that inspire. It gives recognition and inclusion, establishing new societies at a higher level of complexity, able to face the challenges at hand. The collective outcomes of AI-findings will bring humanity at a higher level, aligning technologies with the dignity of mankind. Sustainability implies skills to stay out from the periphery. We can check out anytime we like, but we can never leave!